In ULTIMATE this autumn, we are delighted to present Thomas Struth’s masterwork Art Institute of Chicago II, Chicago, 1990, which is appearing at auction for the very first time. Acquired directly from the artist in 1990, the same year in which the work was created and first exhibited, the present lot is number 1 from the sold-out edition of 10 and has been in the same private collection for over 25 years. Prints of this image have been acquired by the following institutions: The Art Institute of Chicago, Chicago; Hamburger Kunsthalle, Hamburg; and Astrup Fearnley Museet for Moderne Kunst, Oslo. 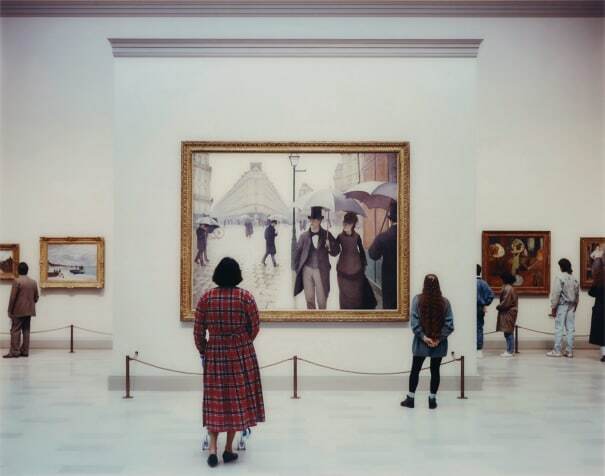 Art Institute of Chicago II, Chicago, 1990, by Thomas Struth is a remarkable work from his first series of museum photographs, his best-known and most acclaimed body of work, in which Struth examines the socio-political dynamic of the museum and the viewer. While these photographs might resemble casual snapshots taken surreptitiously of visitors as they wander through a gallery, they are in fact highly deliberate. Wielding a large-format camera, Struth would spend hours, or even days, on each image. As he set himself up in each location waiting for the right moment, visitors to the space would have noticed him and his camera. In investigating the act of viewing within a museum context, Struth photographed the art and the visitors – the viewer looking at art and the viewer looking at other viewers. Through the multiple layers of viewing, Struth in turn examines the museum’s means of control and representation, what they exhibit and how, as well as what narrative the museum provides for the work in relation to its setting. In his words, ‘the idea behind the museum photographs was to retrieve masterpieces from the fate of fame, to recover them from their status as iconic paintings, to remind us that these were works which were created in a contemporary moment, by artists who have everyday lives.’ By illustrating this through the photographic medium, Struth recalls the history of photography in relation to representation, and by viewing his work in a gallery setting, we are reminded of the photograph as a work of art. Struth’s museum photographs ushered in a new visual language in photography. Along with fellow exponents of the Düsseldorf School of Photography, including Andreas Gursky, Candida Höfer and Thomas Ruff, Struth created new oversized colour photographs – monumental in scale and precision – that rivalled contemporary paintings. Applying new technical possibilities to create their work, these practitioners collaborated with leading photographic laboratory Grieger in Düsseldorf to make their oversized prints and to frame them using the patented Diasec technique. Diasec face-mounting, whereby a photograph is bonded directly to acrylic glazing, enabled these artists to present their large-scale photographs as contemporary art. In the catalogue of the 2002-2003 travelling retrospective Thomas Struth 1977-2002, which included Art Institute of Chicago II, the NY Metropolitan Museum of Art’s Maria Morris Hambourg and Douglas Eklund describe the work as ‘one of a number of museum photographs of exceptional poise, stillness, and spatial precision.’ Art Institute of Chicago II, 1990, features Gustave Caillebotte’s Rue de Paris, temps de pluie [Paris Street, Rainy Day], 1877. Framing the work in the centre of the image, Struth captures two individuals as they contemplate the canvas. This Impressionist masterwork was one of the first paintings to depict the changing city of Paris as a result of its great urban renovation commissioned by Napoleon III and directed by Baron Haussmann. Struth’s choice of painting also echoes his earlier black-and-white photographs of empty streets and architectural sites. This is not surprising as Caillbotte is likely to have painted Rue de Paris, temps de pluie from a photograph or to emulate a photograph. The detailed rendering of the building facades and the sharp cropping of the man at the right edge of the foreground suggest that this painting is an interpretation of a photograph. To create Art Institute of Chicago II, Struth has photographed a painting that in turn was painted to appear photographic thus underscoring the seemingly symbiotic relationship between painting and photography throughout the history of art. When the present work Art Institute of Chicago II is displayed on a gallery wall, it functions to further extend both space and time. The illusionary effect of Struth’s composition is that it drastically enlarges the space where it is hung. The viewer too is invited to enter the layered ‘reflection of consciousness’, as described by Struth, and follow the woman with her pushchair into the painting. In decoding this multifaceted work, the viewer discovers other ways in which Struth links the painting with the two figures standing in front of it. Struth explains, ‘In my museum work, I wanted to connect with the paintings I chose in a particular way, through photographing groups of visitors corresponding with the figures in the paintings I photographed.’ In one example, the plaited hair of the woman on the right and the gilded moulding of the frame next to which she stands create a visual rhyme. In another example, the bold tartan pattern of the dress worn by the woman with the pushchair mimics not only the geometric shapes of the cobbled avenue in the painting but also the line of the stanchion rope that designates the distance between the painting and the viewers. In late 1990, the groundbreaking first exhibitions of Thomas Struth’s museum photographs opened in five major galleries: Marion Goodman Gallery in New York (13 September – 13 October 1990), Galerie Giovanna Minelli and Urbi et Orbie Galerie in Paris (13 October – 17 November 199), Galerie Paul Andriesse in Amsterdam (13 November – 15 December 1990) and Galerie Meert Rihoux in Brussels (18 January - 2 March 1991). The shows opened first in New York, followed by Paris, then Amsterdam, and finally in early 1991, in Brussels. This impressive undertaking enabled Struth to oversee every installation and attend every opening, but also hold all five exhibitions within a period of a few months. Struth himself engineered this collaboration and the participating galleries had little contact with each other. He selected the five venues in order to thematically exhibit the museum photographs based on where the photograph was taken or what was photographed. For example, the Louvre and Musée d'Orsay images were shown in Paris, while the Art Institute of Chicago and Museum of Modern Art were shown in New York and the Rijksmuseum in Amsterdam. As many of the works were taken in Paris museums, Struth ensured they were shown in Paris and this was the only time that his works were exhibited at Galerie Giovanna Minelli and Urbi et Orbie Galerie. Struth produced the five posters for the shows himself, all with the same layout, all printed on Bible paper in Germany. For Struth, this orchestrated first showing of his museum photographs was his way of extending the viewing space and time into the present, adding yet another layer to the viewing experience. Signed, titled, dated and numbered 1/10 twice in pencil on the verso. This work is number 1 from the sold-out edition of 10.